12 of the best phones, tablets and more from MWC 2016 | What Hi-Fi? 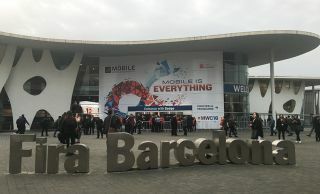 It's been another busy year at MWC 2016 - read on for our pick of the best new kit from the show, featuring new flagship smartphones from Samsung and LG, Dolby Atmos tablets from Lenovo and completely wireless headphones from Motorola. There was even a gesture-controlled Sony Xperia projector! MWC 2016 is coming to a close for another year, and there has been no shortage of new smartphones and tablets for us to get our hands on. From affordable midrange devices to all bells and whistles flagships - plus a few AV products too - we hunted the halls of the Barcelona Fira to bring you the biggest and most interesting launches from the show. The LG G5 has to be one of the most innovative of handsets we saw at the show. Its modular design not only allows you to replace the battery by slipping off the base of the handset, but also opens it up to a certain amount of customisation. So far, LG has announced Cam Plus and Hi-Fi Plus modules alongside it - the former is a camera grip with controls, while the latter acts as a DAC and headphone amp developed in association with B&O. Sony gave its Z series a rest at MWC, and instead turned its focus to a new range – the X Series. The Xperia X is what Sony is calling a ‘super midrange’ handset, aimed at people that want a premium device at a reasonable price. It looks a lot like Sony’s Z range, with its square edges and fingerprint scanner, but it’s now an all-metal design rather than glass. It features a 5in 1080p display, 23MP camera and two-day battery life. Huawei announced the Matebook, a 2-in-1 that looks set to take on the likes of the iPad Pro, Microsoft Surface and Samsung Galaxy Tab Pro in the burgeoning hybrid tablet market. The Matebook is a 12in tablet with a 2160 x 1400 resolution and an 85% colour gamut, super-slim full-metal body and 10-hour battery life. It runs on Windows 10, offers a range of processor and RAM choices and will ship with the stylish keyboard case and the MatePen stylus. The Galaxy S7 might look very similar to its predecessor, the S6, but there are plenty of subtle changes here that make all the difference. From the design refinements, to the addition of the microSD card slot and the super fast camera tech, there is little doubt that the S7 is shaping up to be one of the biggest flagship phones of the year. Alcatel announced the Idol 4 series at MWC, comprising the Idol 4 and the Idol 4S. It’s the latter that caught our eye the most though, thanks to its slightly boosted spec list that includes a 5.5in QHD (2560x1440) AMOLED display, octa-core Snapdragon processor and 16MP camera. There are also two 3.6 watt stereo speakers, designed with JBL, and a “boost” button on the side, which once pressed, offers an enhanced experience in the gallery, music and when playing games. Finally, it ships in a box that doubles as a VR headset, and is Google Cardboard certified. The S6 Edge was an unexpected favourite of ours last year, and after spending a short time with it at MWC, it could well be a similar story this year. The screen size has had a boost and now sits at 5.5in, right in between the regular S range (and last year’s Edge for that matter) at 5.1in, and the 5.7in Note range. Add that to an improved camera, super-fast processor and better edge functionality, and you can colour us very interested indeed. The XA was the second phone announced by Sony at MWC, with a slightly more humble spec list, but a rather interesting design. The XA’s 5in display is completely edge-to-edge, with no bezel on either side, making it narrower than the X when you’re holding it. It’s a 720p screen here though, and you’ll lose out on a few things, with no fingerprint scanner and no high-res audio support either. The Lenovo Tab3 was announced in three sizes, 7in, 8in and 10in, all of which pack Dolby Atmos audio, taking the company’s Atmos-capable line up to more than 10. Aside from the audio side of things though, these tablets are decidedly midrange, with plastic bodies, quadcore processors and rather average screens – only the 10in version packs a Full HD display. But with price tags starting from $99, it’s the affordability that’ll be the big sell for this range. The Plus 10 is Alcatel’s first move into the 2-in-1 market, a 10in tablet that packs a bundled keyboard accessory and runs Windows 10. It features a reversible docking system – one side for working in laptop mode with full keyboard and the other for watching videos in dock mode, with twin speakers to ensure a decent experience without headphones. There’ll be 32GB of on-board storage with a microSD slot to expand and an extra battery in the keyboard for extended the battery life – though this means it will have to be charged. Resolution could be better at 1280 x 800 but here’s hoping for a more reasonable price tag than some of its competition. Alongside its new range of smartphones, Sony was also showing off a range of “smart products” at MWC, including the Xperia Projector concept. It is able to beam an interactive image on to any surface and be controlled by both voice and gesture, allowing you to swipe through menus, and even packs face recognition to show personalised content. Anything that gets us closer to Tony Stark’s tech setup gets the thumbs up from us. Alongside the Full HD Archos Diamond 2 Plus, Archos also launched the Diamond 2 Note – an all-metal device with a 6in, near bezel-less QHD display, octa-core processor and 3GB RAM, running on stock Android 6.0 Marshmallow. There’s a 16MP camera on the back, microSD card slot and a back-mounted fingerprint sensor, giving this handset a really rather premium speclist for a phone only set to cost £250. Motorola was rather quietly showing off its new VerveLife wearable video and audio range of products at the show, but it was the VerveOnes+ that caught our eye, a completely wireless pair of Bluetooth in-ear headphones. Following hot on the heels of the Onkyo W800BT wireless in-ears, they have a claimed 12-hour battery life, and come with a case that doubles as a charging cradle. They're waterproof rated to IP57 and pack built-in dual microphones for hands-free calls. They'll be available in April for €299.